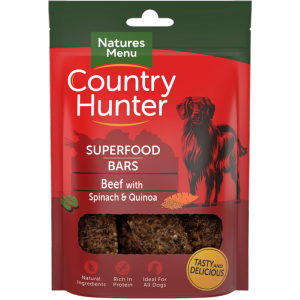 Country Hunter have a new range of treats, their air-dried Superfood bars are made with the finest beef and a blend of spinach and quinoa. With extra fruits and vegetables added to make this a rounded and healthy snack your dog will enjoy. Ingredients: Beef (75%), Glycerine, Pea Protein, Quinoa (4%), Distilled White Vinegar, Minerals, Dried Spinach (4%), Red Beet Powder, Flaxseed, Dried Sweet Potato (0.1%), Orange Zest, Vegetable Oil.